Chargers Soccer Club and Florida Premier FC are excited to announce a collaboration to promote true player development throughout the Pasco, Hernando, Hillsborough, Pinellas and Manatee areas. Chargers SC and Florida Premier FC are two of the longest serving youth soccer clubs in the state of Florida and are two organizations completely committed to helping inspire, develop and lead young women and men to excel on and off the field. Our organizations are player centered and focused on creating a culture that promotes a true club environment with a close-knit family bond, fostering a love for the game of soccer, while challenging and teaching players to better themselves on and off the field. This collaboration will create new and better opportunities for youth players to develop individually and collectively for elite, competitive and recreational level players; Utilizing pathways to the US Soccer Development Academy, AS Roma, National Premier League, FYSA, US Club and Collegiate Showcase combined events and many more avenues. Florida Premier FC players will have access to the Chargers partnership with AS Roma of Italy, including curriculum, ID and Coaches Clinics run by AS Roma coaches and International trips to Italy. Both clubs will work closely to further develop and enhance each club through shared resources, curriculum, education, and training; and will form a cohesive group that works for the betterment of all players. We are excited about this collaboration and look forward to working together to create continued avenues for every player to achieve State, Regional and National success. 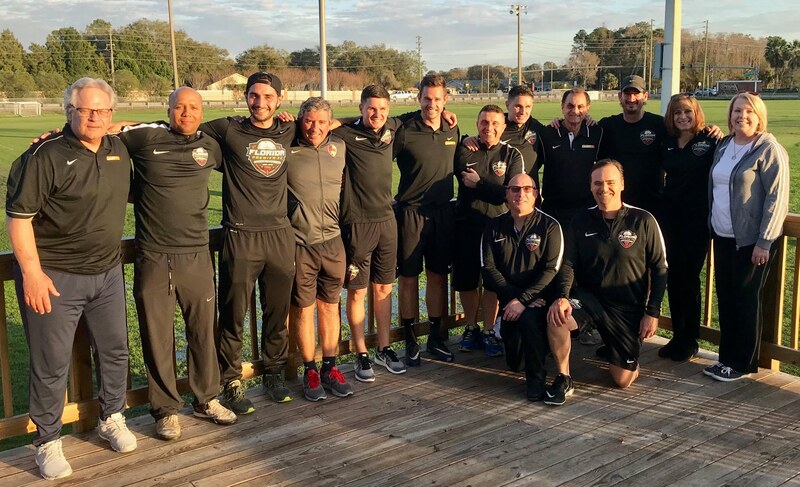 Director Novi Maric and his Staff, to share our curriculum, philosophy and methodology in order to and provide a path for their Players to play at our DA and with our professional affiliates as well"
Director of Coaching for Chargers SC Peter Mannino, “Over the last 43 years we have seen massive change and growth of the business of soccer in the Tampa Bay Area. Standing from the left to right: Jim DiNoble - Chargers Director of Soccer Operations; Danny Torres - FPFC Technical Director Collier Pkwy; Liam Symmonds - FPFC Board Member; Roberto Lopez - Chargers DA Director; Bosho Maric - FPFC DOC Collier Pkwy; Nate Bender - Chargers Junior DA Coordinator & DA U15b Head Coach; Anthony Federico - FPFC President; Novica Maric - FPFC DOC; Peter Mannino – Chargers Director of Coaching; Billy Capobianco - FPFC Technical Director; Denise Stauffer - FPFC Director of Operations; Kathleen Shelton - Chargers Director of Business. Kneeling from the left: Larry Legg - FPFC Vice President and Michael Stanton – FPFC Board Member.